Kalalau Beach is very secluded, only with those brave and fit enough to get to the beach via man powered boat or expert hiking trails. It’s large and backs up to breathtaking views of rugged coastline and classic napali coastline. Adjacent is a famous valley, with vast streams, pools and trails. 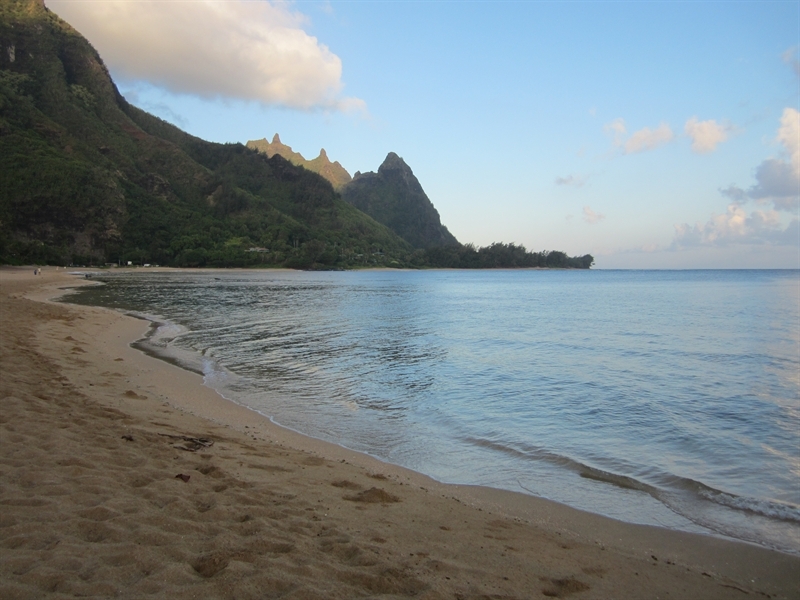 You will find this beach after a 11 mile hike along the Kalalau Trail on the Napali Coast. This beach is fairly private due to the difficult trek to it. You can also get to this beach via boat, which is fairly commonly done via Kayaks (with a permit). It is not legal to get out of or land a motorized boat on the beach, however, it is done illegally. The one way price from Hanalei Bay is usually $75-100 and requires swimming a short distance to the boat. Kalalau beach is about 1 mile long with plenty of trails heading back to the valley. There is no reef to break the waves, so this beach nearly always has high surf year round. There are some companies that offer landing services, meaning they will shuttle you to and from this beach. The trail that leads to this beach is considered the most difficult trails on the islands. It’s rated a 9/10 for technical difficulty, and has many shear drop offs, narrow ledges, and never ending climbs and descents. Most we spoke with ourselves included, recommend hiking all 11 miles in one day. Plan on spending 10 hours in hiking boots if you do this. Those in tip top shape can do it in 8 hours, those more average take 10+. Start early as it gets warm and the trail is challenging enough without afternoon sun the entire time. You may find locals living near the beach, or in the adjacent valley. This is strictly prohibited, however difficult to enforce. Nearby there is a waterfall, that can be used to rinse off or bathe in. Make sure to use the correct filter if you plan to drink the water. Camping requires a permit. However, the camping permits go fast, so itâ€™s wise to get one a year or more in advance. Hoâ€˜oleâ€˜a Falls provides fresh drinking water and is located on the western end of the beach. But donâ€™t drink it straight from the waterfall. The water should first be boiled or treated to sanitize it. There are designated camping areas, however it seems you can camp anywhere, as it’s not typically enforced. Camp fires seem to be allowed (nearly every site has a pit) and there are pit toilets to use in two locations. It’s worth while to bring a way to store water, as the water source is a good trek from the designated camp areas. Use extreme caution when swimming at this beach. It’s really an expert swimmer only beach. During the winter and spring conditions are especially dangerous. High surf pounds the shore creating extremely turbulent waters. You definitely do not want to swim when this is the case. The sea can appear calm here at times (like summer) making it seem safe to swim. But remembers there is no reef to protect the shore, which leaves it vulnerable to long shore currents. In addition, there is a shallow sand bar that runs parallel to the beach but in spots the ocean floor abruptly drops to levels above your head. Be sure to purify your water as it most likely contains leptospirosis, a bacteria from urine. Feral goats have been seen roaming the beach and valley, and contribute to the leptospirosis in the streams and waterfall. Hello! 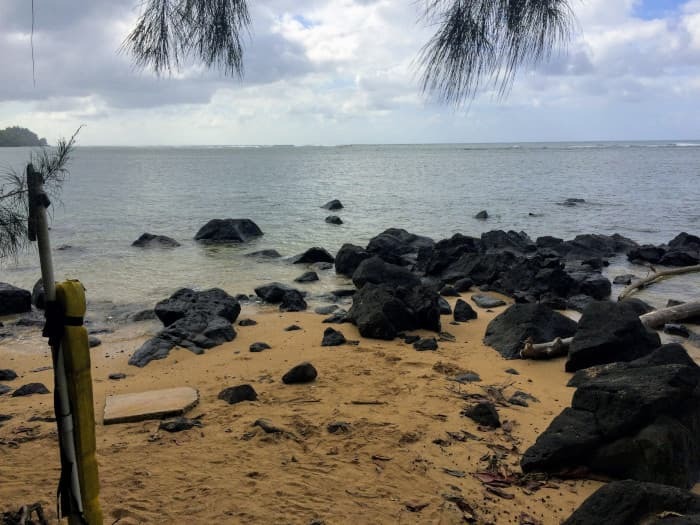 I'm interested in the Kalalau Beach property, with the URL https://www.kauaibeachscoop.com/listing/kalalau-beach/ and I'd like to be contacted for more details.